The sun rose to find us approaching the Straights of Messina, the narrow channel between Sicily and the tip of the Italian boot. A warm and beautifully clear day. Through the straights, past Taormina, to the harbor at Gardini Naxos where we dropped anchor. The tender dropped us at the dock where we boarded our bus for Mount Etna, Europe's largest live volcano. 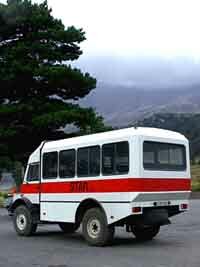 Others took a bus for Taormina. In spite of the warm weather, most of us had jackets and hats as we had been warned that it could be cold on the mountain. Two young couples were dressed, nevertheless, in short and sandals. Ingrid loaned me her backpack. I had realized yesterday that my decision not to bring one had been a mistake. Just two months earlier, Etna had erupted in spectacular fashion. Pictures of the fire and lava were seen worldwide on television and in print. But the fury had died down by now, just a few plumes of smoke rising from the summit. 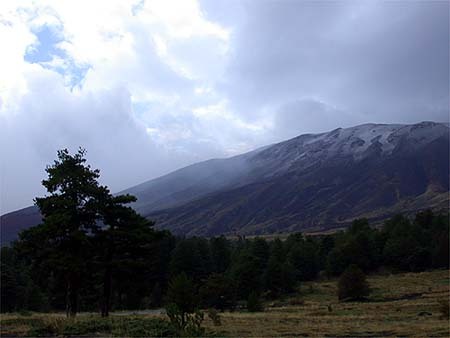 Our guide said the inhabitants of the upper mountain were stubborn people who kept coming back after every eruption. If the lava actually threatened theirs homes, they might leave but would first remove the doors and windows as well as the wooden frames and casings. Upon their return, they would reinstall the windows and doors if the house had been spared, or rebuild and use the windows and doors from the old house. Their stubborn refusal to yield to the volcano earned them the name "lava-heads" from their fellow Sicilians. The bus ride up the mountainside took about an hour, as our guide told us about the mountain, its history, its people and its flora. It was a slow, peaceful ride and some dozed off. The bus took us as far as a lodge, where we transferred to a large 4-wheel-drive vehicle, sort of a minibus with big wheels. We started off on a rather rough road, through the forest of oak and chestnut, and into the clouds. It was a bit cool now. The forest faded away and the only vegetation in sight was astragal, growing in clumps among the rocks. It began to rain. The astragal eventually disappeared and we were surrounded by a moonscape of black lava rock. Up and up we went, lurching from side to side on the narrow road of lava, steep hills above and below us. It got colder, the rain turning to sleet. Then hail, heavy hail. And snow, wet driving snow. Now it was really cold and we were all wide awake. Were we going to stay on the road? Could the driver even see the road ahead? We finally got to the crater's edge and got out of the bus. This volcano has long fascinated man. The Greek scientist Empedocles, who had successfully fought malaria, was convinced that Etna's gasses were semi-solid in form and strong enough to support the weight of a human being. To prove his theory, in 433 BC, he jumped into the crater and was never seen again. Perhaps he should have tossed in a goat first. We peered into the crater but there was little to see but clouds and driving snow. It was windy and very cold (4 deg Celsius). The hearty young couples were hopping up and down, freezing their Teutonic asses off. Too wet to even take the camera out. We didn't stay long. The drivers wanted to go back down before the weather got worse, so back into the vehicle and down that bumpy, slippery road. Descending the mountain was as much an adventure as going up; but eventually the snow stopped, then the rain, and we reached the lodge and our bus. Then back down to the sunny and warm port. Because we hadn't stayed as long as scheduled at the summit, we could have gone into Taormina for a couple hours; but Al, Ingrid and I decided to return to the ship. The September day we visited Mount Etna, Demeter threw a hissy fit. Demeter was the goddess of grain and the harvest. Hades abducted her beautiful and well-loved daughter Persephone and carried her down to the Underworld. This may have happened in Sicily, but it was long ago and no one is certain. Demeter was so incensed that she blighted the harvest, and nothing would grow anywhere on the earth. She appealed to the other gods to rescue her daughter. Finally, Zeus negotiated one of his typical compromises which did not completely satisfy anyone but got them off his case. During the dark months of winter, Persephone would live with Hades in the Underworld, and the rest of the year she would live with her mother in the brilliant light of the Mediterranean. As we climbed the volcano in our four-wheel-drive Mercedes assault vehicle, the visibility dropped to zero and hail stones clattered on the roof and windows. Our Sicilian guide told us that unseasonal late summer rains sometimes occur in Sicily when Demeter weeps as she contemplates Persephone's imminent return to the Underworld.